From feeling insecure about yourself to holding back from living your life to the fullest, confidence has a big impact on the way your life looks and feels. If you have confidence in yourself, then great things can happen for you, but if you don’t then life can become self-defeating. So what exactly is self-confidence? Confidence can be viewed as how you think and feel about yourself and can vary depending on the situation you are in. For example, some people can have confidence in themselves in their role at work, yet may lack confidence in their body image. Most of us would like to think that we are confident all the time, yet that is rarely true. What gets in the way of having unshakable confidence in who we are and what we can be, do, or have in life – is fear. When we let fear control our thoughts, words, and actions, then it becomes easier to avoid things we are afraid of rather than move towards them and become more confident. There will always be something in our lives that we have confidence in. Whether it’s something as brushing our teeth, or our ability to do something that we’ve done a thousand times before. It makes sense then that the more we practice something, the more confident we’ll get at it. That’s where meditation can help. Meditation is a tool for focusing the mind and the more you can focus the mind in a non-judgmental way towards yourself and others, the easier it will be to feel confident about yourself again. Meditation helps to transform a lack of confidence and belief in yourself as it enables you to practice accepting yourself mentally and emotionally. Just by sitting quietly and observing your thoughts and feelings as they arise from moment to moment, without judging them, tells your subconscious mind that you are okay as you are. As you continue to apply this focus on a daily basis, even if it’s only for a few minutes a day, you’ll soon start to connect to a deeper place of trust and certainty within yourself. This transformation happens at a very deep level and before you know it, you’ll feel a sense of calmness and confidence that no-one or nothing can ever take from you. Positive self-talk helps to change the way you think and feel about yourself. You can do a simple 5-minute positive affirmation meditation once a day to help reprogram your internal beliefs for more confidence and success. An affirmation I like to use is, “I love and approve of myself”. Since we already know that confidence comes with practice just pick something that you want to be more confident with and start doing it until it happens. This is a really easy way to exercise your confidence muscles and let your old fear based patterns know that their time is up. A simple meditation you can do to help boost confidence is to close your eyes and think about a time in your life when you felt filled with joy. Keep remembering those moments of pure joy so that you can really feel it flowing through your entire mind and body. Do this for 5 to 10 minutes each day. Spend at least 5 minutes focusing on all the things you are grateful for either big or small in your life. If you can, allow yourself to feel how thankful you are for these things and stay focused on the feeling of gratitude. You can do this meditation either in the morning or just before going to sleep. This is an invitation for you to bring more loving kindness deep inside every cell of your body. Take a moment to close your eyes and then bring your focus to your heart. Imagine that you are breathing in pure love from the Universe into the center of your heart. Then, as you breathe out, imagine that you are breathing out pure love from your heart into the world around you. 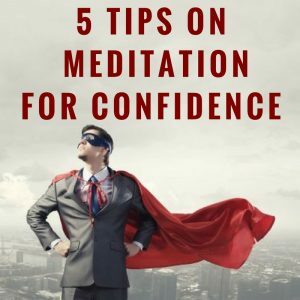 These are just a few of an abundance of ways that focus meditation can help you to release thoughts and feelings that hold you back from living with confidence. Once you are certain that you deserve to be loved, then nothing will ever stand in your way again.